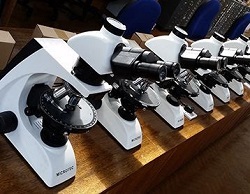 A NEW suite of over 70 Microtec light microscopes has been installed by Mazurek Optical Services at the School of Earth and Ocean Sciences at Cardiff University, UK. The school selected 50 Microtec RM-1 transmitted and 23 dual LED polarising microscopes supplied by Mazurek Optical Services, after going to national tender for new instruments for its petrology labs. Deputy head of school, Professor Wolfgang Maier, said the RM-1s were “clearly best value for money” without compromising build quality and optical performance. Mazurek Optical Services changed the adjustment thumb screws for the rotating stages and condensers to grub screws, to help keep the instruments in alignment and to make them more student-proof. “Student-proofing of microscopes is something we have offered for some years commented MOS owner Stephen Mazurek. The Microtec RM-1 MET microscope is described as a research quality metallurgical microscope at an extremely competitive price. The School of Earth and Ocean Sciences at Cardiff University offers students a research-led experience across a wide raft of disciplines, and the microscopes have already been used in the undergraduate teaching laboratories.